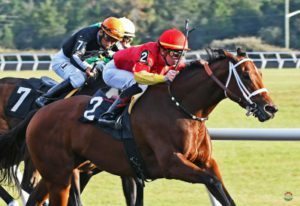 Trainer Mark Casse saddled the winners of the inaugural runnings of the OBS Sprint Stakes as the Ocala Breeders’ Sales Company presented it’s 2018 November Day of Racing. The first six races of the ten-race card were for quarter horses. In the first race, Rocio Lopez’ Eyes Have a Fortune was the winner by a nose, running the 220 yards in a track record :21.727. Trained by his owner, the 6-year-old gelding was ridden by Ruben Serna. Despite delaying the start by his reluctance to enter the starting gate, Howard Kleinberg and Kelly Kleinberg’s Mr So So Comment was a one length winner of the second race, running 330 yards in :17.207. The 6-year-old gelding, trained by Howard Kleinberg, was ridden by Natasha Fritz. The third race went to Myron McKinnon’s Toast to Clever Two by three quarters of a length, with David Boraco aboard for trainer Walter Lee Graham, running the 330 yards in :17.204. The combination of McKinnon and Graham made it two in a row in the fourth, with Dlj Royal Flow scoring by a head. The 4-year-old horse, ridden by Reynier Arrieta, ran 330 yards in :17.041. The same connections scored their third win in a row in the fifth, with One Way Flight running 220 yards in :12.19 and winning by a head. Reynier Arrieta was aboard the 4-year-old gelding. Rocio Lopez picked up her second win of the day in the sixth race, as Hesa Trickie Lad won by a length and survived a claim of foul, running the 220 yards in :12.006. Ruben Serna rode the 9-year-old gelding. The seventh race was a six furlong race for maiden thoroughbreds, and it went to Jack Treadway and Ken Westlye’s Tellbuffy, who caught front-running Silver Springs in the final furlong and scored by a 4-1/2 lengths. The 4-year-old Florida-bred daughter of Telling, trained by Ken Westlye and ridden by Odilon Martinez, ran the distance in 1:13. 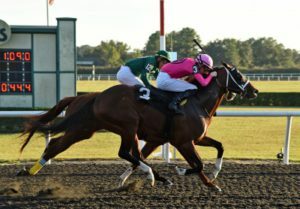 Race eight, a six furlong thoroughbred starter allowance, was won by Michaelle Bordis’ Circle Away, who rallied to get up in deep stretch and win going away by a length and a quarter, running the distance in 1:11 4/5. The 4-year-old gelding by Circular Quay, trained by Robert W. Bordis, was ridden by Raymond Torres. For more information regarding the OBS Day of Racing, please call (352) 237-2154 or visit the OBS website at obssales.com.